Award-Winning Poet, Novelist Judith Ortiz Cofer Welcomed to Speak on "Good and Evil"
Nova Southeastern University was pleased to welcome Judith Ortiz Cofer, an award-winning poet, essayist, and fiction writer, to the main campus on Wednesday, March 15, 2006. Cofer read from her work and gave a talk from 7:00-8:30 p.m. in the Mailman-Hollywood 2nd Floor Auditorium. Cofer's reading and talk were offered in conjunction with the exploration of a single theme each academic year. This year's theme was "Good and Evil," which was examineded throughout the year in classroom discussions and assignments, in addition to special public events like Cofer's visit. 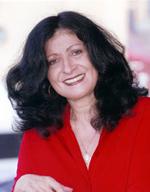 Judith Ortiz Cofer is a native of Puerto Rico. Her novels include The Meaning of Consuelo (Farrar, Strauss, & Giroux, 2003) and The Line of the Sun (University of Georgia Press, 1989). Her collections of poetry and essays include A Love Story Beginning in Spanish: Poems (University of Georgia Press, 2005), Woman in Front of the Sun: On Becoming a Writer (University of Georgia Press, 2000), The Latin Deli: Prose and Poetry (Norton, 1995), and Silent Dancing: A Partial Remembrance of a Puerto Rican Childhood (University of Houston Press, 1990). Her work has appeared in The Georgia Review, The Kenyon Review, Southern Review, Glamour, and other journals and magazines. It has also been included in numerous textbooks and anthologies, including Best American Essays 1991, The Norton Introduction to Literature, The Norton Introduction to Poetry, and The Heath Anthology of American Literature. Cofer has won numerous awards, such as the Anisfield Wolf Book Award and a PEN/Martha Albrand Special Citation, as well as fellowships from the National Endowment for the Arts, the Witter Bynner Foundation, and the Rockefeller Foundation. She received her M.A. in English from Florida Atlantic University. During 2001, she was Vanderbilt University'Äôs Gertrude and Harold S. Vanderbilt Visiting Writer in Residence, and she is currently the Franklin Professor of English at the University of Georgia.